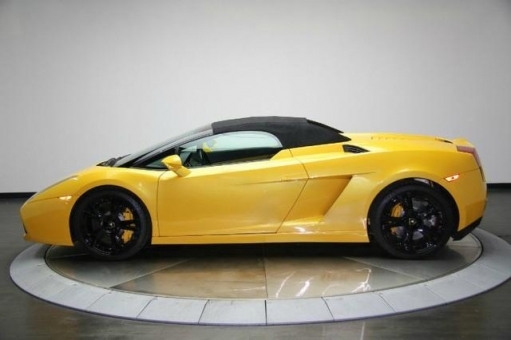 I am proud to present this absolutely stunning 2008 Lamborghini Gallardo Spyder 5.2 Liter V10 520HP. EGEAR. This car looks as it drives. It is an absolutely immaculate car inside and out and it has always been stored in a climate controlled garage. New rear Performance Rotors and Brakes included Ebrake just done! Options include Egear $10000 Option Adult Owned Never Tracked Exhaust System Front Lifter $4700 option Navigation Rear Camera Premium Sound Heavily Equipped MSRP was over $240000 Carfax & Autocheck CertifiedGiallo MidasPaint $9000 option w Nero interior Clutch snapshowed75 left Black Powdercoated Wheels and Tires. 1 Key Books Floor Mats and Books included!